Around eight years ago, three of us found ourselves maintaining a fairly large multi-language distributed system. Originally, each component was maintained by their original authors, so it was relatively easy for them to ensure that things were good with that component, but with the development phase ending, most of them moved off to other jobs. While we knew our way around most of these systems, we did not have the bandwidth to check on each of them regularly. So our manager came up with the idea of a central monitoring application, which we built and used with great success. Monitoring scripts written in Perl were deployed on the servers where the actual components ran, and a Perl client queried them both via cron and on-demand from a console, and reported the results. In retrospect, I think this was my first experience with management applications. 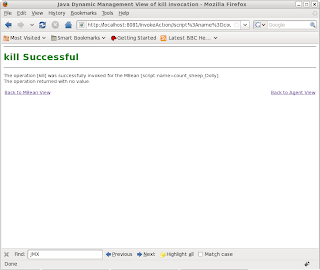 My next job was with a web publishing house, and although I did not actually work on any of the backend systems, my middleware components would interact with some of them, and without exception, all of them had embedded HTTP (mostly Jetty) servers reporting status of the application in real-time. This was my second experience with management applications. More recently, I have been thinking about a problem closer to home. Our backend systems are composed of shell scripts calling Java and C/C++ components, and the only way to see what is happening with them is to actually log into the machines and look at their logs, for which, as developers, we have no access. Since most scripts notify on errors, there is the possibility that a script never ran, and developers will only find out about this when they see the side effects (or lack of it) in their application. I had read about JMX in the past and had even tinkered with it, but never found a compelling reason to use it - that is, until now. The solution I came up with is a hybrid of the two approaches described above. 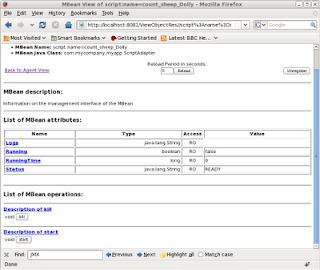 Like the first approach, the MBean relies on standard operating system commands to do the monitoring, and like the second, I use a HTTP server to display the monitoring information, although I use the JMX tool suite's built-in HTTP Adapter rather than build a custom one. Here is my toy script that I want to set up JMX instrumentation on. It's a script to count the number of animal clones. Depending on the argument provided to it, it whips out a cloned sheep (Dolly) or a parrot (Polly) every 30 seconds and logs a count. Scripts should always write their PID into a .pid file at a specific location on startup and remove it on normal termination. Scripts should write progress information into a .log file at a specific location. Scripts should write error information into a .err file at a specific location only if there is an error. 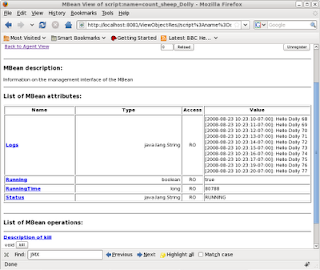 Our MBean to monitor and control scripts is a standard MBean, and its interface is shown below. Notice that we expose the operations "start" and "kill" (it runs in an infinite loop), and a bunch of read-only properties (signified by getXXX methods). In order to start the script, we pass in the path name of the script and its arguments via a constructor in its implementation. This is for security, so people cannot start up "/bin/rm -rf *" via JMX for example. The corresponding implementation is shown below. As you can see, for each of the exposed operations and attributes, I spawn a Java Process and run operating system commands through it, similar to what a human user would do if he could log on to the script's host machine. * are injected via ctor for security. * @param path the full path to the script. * @param args the arguments to the script. * so it will not be available as a manageable attribute. * @return the computed adapter name. * to locate the correct pid file. * If isRunning, then status == RUNNING. * this point in time. * @return the last 10 lines (or fewer) of the log file. * Operation to start the script. * PID from the .pid file. 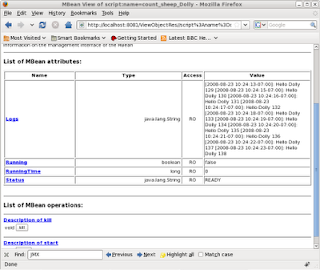 Finally, we build an MBean server agent that will load up one or more instances of our MBean. In order to expose the HTTP interface, we also load in the HtmlAdaptorServer and set it to listen on port 8081. And point our browser to http://localhost:8081. In my little experiment, everything is on the same machine, but in a real-world setup, I would be pointing my browser to a server agent listening on a remote machine. And now, on to the mandatory screenshots, to walk you through a typical flow using the MBean HTML adapter. The Agent View - we have loaded two instances of the ScriptAdapter MBean, one to manage the script for cloning sheep and one for cloning parrots. The MBean view for the sheep cloning management bean. I've rolled it down a bit so you can see both the kill and start operation buttons. Notice the status attribute "READY". Right now, logs are empty, since there are no logs in the file system. Clicking on the [Start] button says "start was successful". Lets go back to the MBean view by clicking the Back to MBean View link. 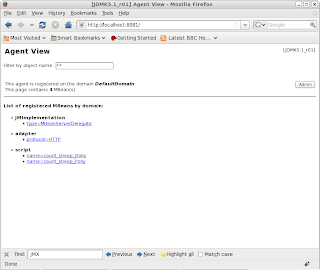 The MBean view shows that the script is running. Notice the status attribute "RUNNING" and the non-zero value of RunningTime. If you reload, you will see the logs and the running time refreshing. Once we have enough of sheep-cloning, we can kill the process by hitting the [KILL] button. This will produce the "Kill Successful" page. 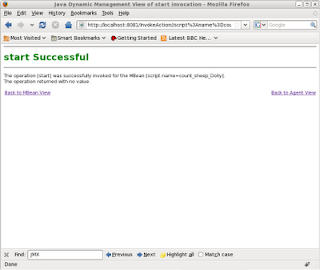 Back at the MBean view, we notice that the status is READY (to run), and the isRunning value is false. We also notice the logs from the last run in there, just in case one needs to do some post-mortem. If you don't like this, then you can remove the .log file in the script or change the MBean code to check for isRunning() before showing the logs. For the longest time, JMX appeared to me to be useful for tool and middleware vendors, but somewhat pointless for application developers, so I never really pursued it. The only time I have seen it being used by application developers in web application development is to build in backdoors to the application to turn on and off verbose logging for a short time, for example. This application seems to be a good use of JMX. Obviously there is much more to JMX than what I have done so far, but I plan to experiment with some more features of JMX and describe it in future posts.